FourFreedomsBlog - A Massive Cover up? Perhaps. A Massive Cover up? Perhaps. "There are so many answers we don't know," McCain told host David Gregory. "We've had two movies about getting bin Laden and we don't even know who the people were who were evacuated from the consulate the day after the (Benghazi) attack. So there are many, many questions. So we've had a massive cover-up on the part of the administration." Gregory then pressed McCain on what the Arizona senator meant by "a massive cover-up." "I'm asking you, do you care whether four Americans died?" McCain said. "And shouldn't people be held accountable for the fact that four Americans died?" "Well, what you said was the cover-up--a cover-up of what?" Gregory asked. "Of the information concerning the deaths of four brave Americans," McCain replied. "The information has not been forthcoming. You obviously believe that it has. I know that it hasn't. And I'll be glad to send you a list of the questions that have not been answered, including 'What did the president do and who did he talk to the night of the attack on Benghazi?'" After grilling former Secretary of State Clinton, Leon Panetta and Chuck Hagel (to name a few) over the events of Benghazi, John McCain appears to have entered conspiracy territory. Never mind that he "missed one of the briefings about the attack on America�s consulate on Benghazi because he was in the Senate Radio-TV Gallery demanding answers on Benghazi". Never mind that he's on the Senate Armed Services Committee and has access to classified papers regarding the affair, it seems that nothing is good enough with regard to what happened last September. The question is why? Why is he so rabidly attached to this issue? Most people don't bring rocket-propelled grenades and heavy weapons to a demonstration. That was an act of terror, and for anyone to disagree with that fundamental fact I think is really ignoring the facts. Now, how long it was planned and who was involved, but there is no doubt there was extremists and there's no doubt they were using heavy weapons and they used pretty good tactics--indirect fire, direct fire, and obviously they were successful. After that spontaneous protest began outside of our consulate in Benghazi, we believe that it looks like extremist elements, individuals, joined in that-- in that effort with heavy weapons (...) It's clear that there were extremist elements that joined in and escalated the violence. Whether they were al Qaeda affiliates, whether they were Libyan-based extremists or al Qaeda itself I think is one of the things we'll have to determine. Note, these two things sound quite similar. What is interesting is that just a few months earlier McCain falsely claimed that the U.S. armed Libyan rebels in an attempt to make the case for arming Syrian rebels. Wolf, even in Libya, we did not take the very exceptional decision to arm the opposition. And in Syria, we know much, much less about the nature of this opposition. It�s not coherent�. So to argue that we ought to be arming the opposition is a very consequential statement. And I don�t think that those that are advocating that have fully thought through the consequences. It should be noted that just a week before McCain made these comments, he had visited Tripoli during the post revolutionary Egyptian Elections. During that visit, it is rumored that he held a secret meeting with rebels in Egypt. Ambassador Stevens was not present, according to said rumors: This photo is inconclusive and cannot be properly sourced. "to get an on-the-ground assessment of the situation" and to meet with opposition leaders and members of the rebel military. "They are my heroes," McCain said of the rebels as he walked out of a local hotel in Benghazi. (snip) Details of the trip were shrouded in secrecy due to heightened security in a country fiercely divided by the two-month-old anti-Qaddafi rebellion. It should be noted that he went on this trip not as an official emissary. �We were aware that Sen. McCain would be making the trip and State supported the codel,� White House spokesman Jay Carney told TPM in an e-mail Friday afternoon. This is a picture from that trip to Benghazi: The man to the right of the Senator is the late Ambassador Stevens. There is video of this as well. The building he was walking past? The video at the link has been removed (NOTE: it can be found here, but be forewarned that it is gruesome and NSFW), but it is worth noting "And here is footage of the rebel lynching which took place before Senator McCain�s visit, at the same location. The video shows a man being strung up and beheaded." That man? He was Pro-Qaddafi. I'm reluctant to even use it as a source, but the Daily Caller even noticed it. In the video, the beheading victim can be seen suspended upside down in front of a burnt-out building. A crowd of hundreds is gathered around to watch; many of the spectators are filming the proceedings on mobile phones. One minute and twenty seconds into the CNN report, McCain is seen walking past the building where the beheading took place, accompanied by Abdul Hafez Ghoga, vice-chairman of the Libyan rebels� National Transitional Council. 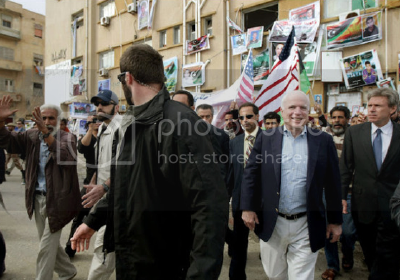 Members of the group walking with McCain wave American flags, and shouts of �Allahu Akbar!� ring out as a smiling McCain walks by the site of the beheading. March, 2011, shortly after NATO began bombing Libya, journalists the world over were warning that the so-called "pro-democracy" protesters the West was purportedly protecting were in fact notorious extremist groups with a 30 year history of terrorism in Libya and abroad. Dr. Webster Tarpley provided documented evidence collected from the US Army's own West Point study, indicating the the epicenter of the so-called "revolution," was in fact the global epicenter of Al Qaeda recruitment. It would be in this epicenter that John McCain would give his speech, and where Ambassador Stevens would later be killed. Before the Benghazi attacks, Ambassador Stevens warned of Islamic extremism. In a diplomatic cable in June, the U.S. ambassador to Libya cited the rise of �Islamic extremism� and displays of �the Al-Qaeda flag� over buildings outside the city of Benghazi, where he and three other Americans would be killed in a terrorist attack on Sept. 11. The previously classified cable is among 166 documents made public Friday by Rep. Darrell E. Issa, chairman of the House Oversight and Government Reform Committee, who says they expose an egregious security shortage at U.S. diplomatic missions in Libya in the months before the attack. What if we were to find out that John McCain called for arming the very people that may have killed Ambassador Stevens, Sean Smith, U.S. Foreign Service, Glen Doherty and Tyrone S. Woods? When will Senator John McCain appear before the Senate to tell us what he may know? I'm just asking questions here. At a certain point, someone needs to ask specifically why John McCain has been SO vocal about the events in Benghazi. Perhaps John McCain is hoping that these events were from Pro-Qaddafi factions? So far, it doesn't appear to be the case. 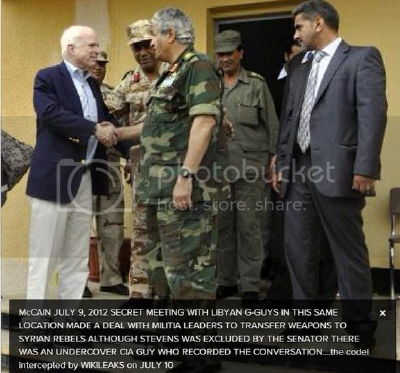 I propose this: It's time John McCain be brought forward to answer questions about his trips to Syria and Libya - under oath - in front of the Senate and his peers. Did he meet with rebels? Was he part of an arms deal? Did he play a part in the murder of 4 Americans in Benghazi on 9/11/2012? Could this be why he so vocal about that day? Is he trying to deflect from his responsibility for what happened? Projection, is thy name McCain? What is McCain hiding? He's got lots of questions, but considering his history and multiple visits to the region, I suspect he may very well have a few answers. They are his heroes, after all. If there is a massive cover up, Senator McCain needs to tell us what exactly is being covered up.